One of the biggest questions surrounding mobile technology-especially tablets-is whether it will open up new revenue opportunities to support the news gathering and reporting in ways that did not occur in on desktops and laptops. One rationale is that the pleasure and convenience of reading on a mobile device might induce people to pay for that content. And ads in this space, with higher resolution and potential for greater interactivity, might be received differently than on the desktop. The October report revealed that the broadening of the tablet universe has not made people more likely to pay for content. But there did seem to be more response to advertising in this news space than in the desktop realm. 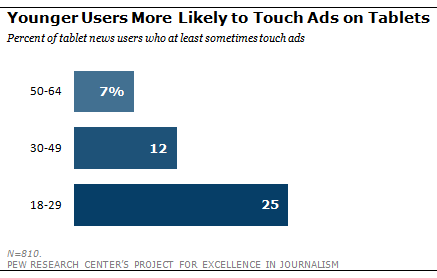 While still limited, 49% of tablet news users say they notice ads at least sometimes when getting news, and 14% at least sometimes touch or click on those ads. That raises the question then of whether certain demographic groups are more likely to respond than others. PEJ’s deeper analysis shows that while there is very little gender or age difference in noticing ads on either device, there is a difference in how people respond to ads in the tablet news space. Among all weekly tablet news users, 18- to 29-year-olds are more likely than other age groups to at least sometimes touch or click on ads. A quarter or 18- to 29-year-old tablet news users touch ads (25%) versus 12% of 30- to 49-year-old news users and 7% of those 65 and older. There is a different demographic breakdown on the smartphone. There, the groups more likely to tap on ads are blacks and Hispanics. While blacks, whites and Hispanics all notice ads to similar degrees when getting news on their phone, blacks and Hispanics are both more than twice as likely as whites to at least sometimes touch or click on ads on their smartphone (23% of non-Hispanic blacks and 22% of Hispanics), compared with only 7% for non-Hispanic whites. Another area of revenue potential is subscription fees. With roughly 300 newspapers now charging some kind of fee for digital content, the industry is clearly moving in this direction. Our survey found that even among mobile news users, print-only subscriptions outweigh digital. But, 19% of these mobile news users have paid for some form of digital subscription – 14% bundled with print and 9% digital only. Here, according to this analysis, older users stand out. 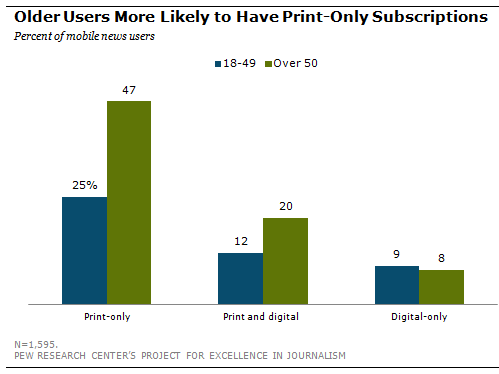 Mobile news consumers over the age of 50 are more likely than those under 50 to have a print-only subscription (47% versus 25%) or to have a combined print and digital subscription (20% versus 12%). Digital-only subscriptions are equally rare among both age groups (8% of those over 50 and 9% of those under). One group that stood out for being more inclined to spend money via their tablet was those who have a mobile data plan and therefore have paid to have access the internet anytime and anywhere. They account for only about a quarter of all tablet owners (26%) but are more likely to have every kind of subscription – print-only, bundled and digital only. But according to this data, the young – active in so many other ways – are the least likely age group to have a data plan. Just 14% of tablet news users under 30 have data plans, compared with at least twice that for other age groups.